Check the comments, including mine, here. Israel police broke into the Temple Mount compound in Jerusalem's Old City on Sunday, after Palestinian worshippers hurled stones at non-Muslim visitors of the holy site, barricading themselves in one of the compound's mosques. ...Adnan al-Husseini, a Palestinian official in charge of Jerusalem, said Palestinian youths had spent the night at the mosque saying Jewish hardliners had threatened to enter the site. 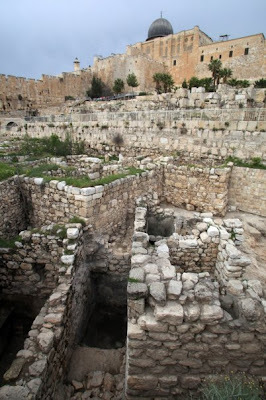 Israel's government decided that two sites located in Judea and Samaria will be treated as part of the national heritage preservation scheme. Those two, Hebron's Cave of the Patriarchs and Rachel's Tomb in Bethlehem, are Jewish sites with a history of thousands of years. For the past 43 years they have been under Israel's administrative control. So, what do the Arabs do. They riot. They riot and they deny any Jewish connection to any part of the Land of Israel. And they suggest that "Jewish hardliners had threatened to enter the site". But that's permitted. And is done almost daily. And if the Arabs wouldn't throw stones, shout, scream and yell and make outrageously false claims, all religious locations could be shared by all. But, if the Muslims continue excluding us from our sites in one way or another, obviously they cannot expect any quid pro quo. If we cannot enter, cannot excavate, cannot pray, cannot visit, do they presume there will be reciprocity? Palestinian worshippers hurled stones at non-Muslim visitors of the holy site. Non-Muslim means also Christians. So what happened to all that Christian-Muslim solidarity? Israeli police say they have entered a compound in Jerusalem containing the al-Aqsa mosque, one of Islam's holiest sites...The site also contains the Western Wall, a sacred site for Jews. Dear BBC, no, the Western Wall is not in the Temple Mount. It is an external supporting wall. And, the Temple Mount is what is sacred to the Jews. The compound, known by Muslims as the Haram Ash-Sharif, is the third holiest site in Islam, believed to be the location where the Prophet Muhammad ascended to heaven and returned. 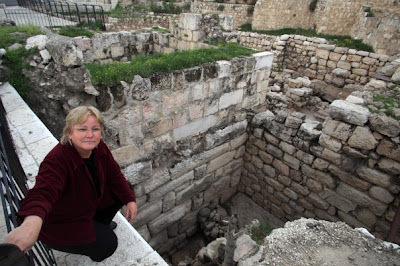 The site is the holiest for Jews, who believe it to be the site of the Second Temple, destroyed by the Romans in 70 AD, and is referred to by Jews and Israelis as the Temple Mount. You need a reason to think oddly of Jews? Not mean hate. Not frothing antisemitism. Just that bewildered "what the...?". Her fortunes have drastically improved since her mother’s death, her third marriage and her child’s recovery...Shapiro explores various flavors of belief that exist, she says, “on the other side of logic”: “energy work” with a woman who channels spirits by the laying-on of hands; the spirituality of Alcoholics Anonymous meetings, which in her 20s Shapiro attended for years, though she did not really think she was an alcoholic; a form of Judaism that is loving and comforting, unlike what she perceives as the punishing, judgmental Orthodoxy of her youth; the Brahma Viharas, the key virtues of Buddhism (loving kindness, compassion, sympathetic joy and equanimity) — is it possible for any human being to consistently practice them? So, what went on previously? She grew up in a tense Orthodox Jewish household where her parents were deeply divided about religion. Her observant father became addicted to painkillers; her mother resented her faith and seethed with rage, much of it directed at Dani. Shapiro often felt like the black sheep — or, as she puts it, the “blond sheep” — in her own home. She rebelled, drank too much, dropped out of college, became mistress to her best friend’s stepfather, a wealthy married lawyer, in a spectacularly ill-­advised affair. Then a car crash, in which her father was killed and her mother broke 80 bones, altered her life forever. Her site. I know you're interested. Between whom? Between what opposing views? All three are far-left with Klug an Independent Jewish Voice, Newman attacking in classic McVarthy-style the NGO-Monitor group and Levy, well, he's been at the Geneva Initative and is going left. For sure, though, a good collection of self-hating Jews. JBW has been criticised for hosting on Sunday the critical of Israel editor of the London Review of Books (LRB), Mary-Kay Wilmers. Last year Wilmers told The Sunday Times: "I'm unambiguously hostile to Israel because it¹s a mendacious state. They do things that are just so immoral and counterproductive and, as a Jew, especially as a Jew, you can't justify that." LRB did the first review of Walt and Mearsheimer's 'Israel Lobby' book in 2006 and LRB writer Ed Harriman produced the documentary earlier this year that implied there was a powerful and influential Israeli lobby at work in the UK. D'Amico told the Jewish Chronicle this week that Wilmers has been invited to discuss her latest book and not her views on Israel. But, of course. What else would she discuss? Oh, here's a review of that book and I am confident that Mary-Kay will easily slip Israel into her family's history retelling. LOS ANGELES, Feb. 26 (UPI) -- A silicone breast implant saved the life of a California woman who was shot in the chest by a gunman, a doctor says. The gunman aimed his weapon directly at Lydia Carranza's heart but one of her implants stopped the bullet and prevented any fragments from reaching her vital organs, the Los Angeles Times reports. "She's just one lucky woman," said Dr. Ashkan Ghavami. "The bullet fragments were millimeters from her heart and her vital organs. Had she not had the implant, she might not be alive today." Did you hear the one about how many Mossad lightbulbs agents you need to wet out a Hamas operative? It's now close to 30, and climbing. It's those darn passports that keep getting in the way. And the State Department itself is being quite provocative after investing its own money in developing cultural heritage projects that are in that same area but are off-limits to Jews! 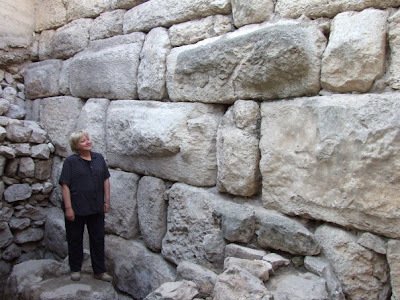 Tel Aviv University archaeologist Israel Finkelstein, who was not involved in the excavation, agrees that it's possible King Solomon constructed the wall. But Finkelstein cautioned against leaning too heavily on the Bible to interpret the findings. Familiarity with religious or historic texts connected to any given site is important, he said, but their usefulness can vary. "It depends upon the text. Each has its own characteristics, each needs to be approached differently," he said. "There is the question as to when it was written—300 years after, or at the time of the events? What are its goals and its ideology? Why was it written?" Well, he's neutralized himself. Whew. I can't travel this year so I'm giving my passport to the Mossad is now at Facebook. The shopping is really great. 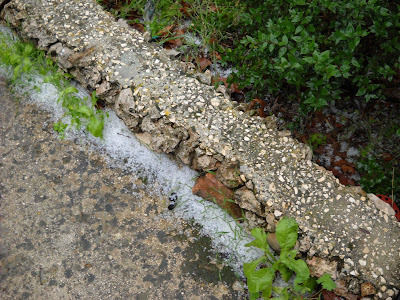 The “El Har HaMoriah” (To Mt. Moriah) Institute has finally received police permission to hold a tour around the Temple Mount gates in the Old City – but the restrictions make it nearly unfeasible. The tour must not enter the cemetery next to Mercy Gate, nor the adjacent Arab school, nor may the participants come within two meters of Cotton Gate. And I thought the Temple Mount was limited to an area of a 500 cubit square. This 'reaching out' by the police will only increase a 'reaching in'. Ethan, Bustan in Arabic means Garden or Orchard. The Arabs are foreigners, and have been since 638, and are occupiers, turning Jewish land into what they wish you and other to supposedly consider as Arab land since time immemorial". Hebrew came first. You see, the Arabs "borrowed" not only the name but the history of the Jews there. It's not even a contest. That name, Gan HaMelech, the King's Garden, is found in Second Kings 25:4 and in Jeremiah 39:4, for example. The Arabs came to Jerusalem, calling it Beyt El-Makdas, the Beit HaMikdash, the Temple. Almost all iof the names of existing Arab locations in the Land of Israel are either translations of or adaptations to the original Hebrew placename. is they who are contesting and attempting to illegally rewrite reality. Don't let them steal our nomenclature, our history, our identity, our land. Andrew Sullivan of The Atlantic has been quite ferocious recently on the Israel front. His latest rant is here where is generously includes a critique of his postion and responds. ...I can understand if some draw the line at anything that might risk the actual security of Israel. But freezing construction of settlements on the West Bank? How could that affect Israeli security? 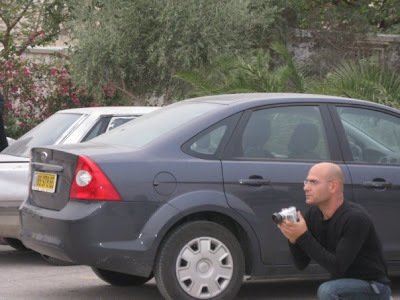 Many Israelis believe it is essential to Israel's future security. It is the least Israel could do to help its largest ally and supporter. But even this ... is out of the question and followed up by provocation after provocation. Many pundits like Sullivan believe the polls, usually published in Ha-Ha-Haaretz and other outlets of a very certain political/ideological character, that tend to provide a soft, minimalistic outlook by a supposed majority of Israelis assuming the "peace now" line (that's with a lower 'p' and 'n'). And due to the questions, that usually is the case. But real polls as elections and over the past 43 years almost, the parties that promise security, continued Jewish residency in Judea and Samaria, firm commitment to Jewish history and heritage usually form the governments and those who don't and still form a coalition usually find their coalition collapsing when they assume another policy posture, even those of the Right, i.e., Netanyahu after Wye and Hebron. This is stupid and probably a result of judaeophobia. Netanyahu doesn't need to do that. The Muslims are doing that very well and in fact, either Obama and his advisors, or whoever pointed him in that direction (Rashid Khalidi? Edward Said? ), seem to have erred in that approach from its very foundation. The Muslim world doesn;t need Netanyahu's assistance. Unfortunately, ever since FDR's boat ride with Ibn Saud, the American Presidency had been both enamored and screwed over repeatedly by the Muslim world (with exceptions, of course) and led by the nose to blame the Jews, or Zionism. Sullivan has no good answer for why the Pals. haven't come to the negotiating table following the construction moratorium. So, blame the Jews for statements, for provocations, for lack of sensitive timing (see his piece). Sullivan doesn't grasp this and is sullying himself. 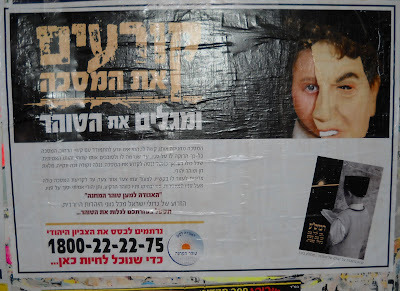 For a newspaper to publish a photoshopped Anne Frank winking, even in a Purim spoof edition, is not only tasteless but sacrilegious (“Backward,” February 26). Just Who Is Provocative and Unhelpful? On Wednesday yesterday, State Department spokesman Mark Toner got all provocative and unhelpful to the goal of restarting peace talks. the State Department on Wednesday sharply criticized Israeli Prime Minister Benjamin Netanyahu's government for adding two shrines in the West Bank to Israel's list of national heritage sites. The move, announced Sunday, sparked Palestinian protests and has drawn criticism from other quarters, including the United Nations. State Department spokesman Mark Toner said the administration viewed the move as provocative and unhelpful to the goal of getting the two sides back to the table. Patriarchs in the West Bank town of Hebron and the traditional tomb of the biblical matriarch Rachel in Bethlehem had been conveyed to senior Israeli officials by American diplomats. I've searched for a State Dept. source but haven't come up with one. But never mind, the point that needs to be made is twofold: what is the problem and is there hypocrisy here? The Israeli military occupation of Palestine since 1967 coupled with the introduction of limited autonomy in 1993 has positioned the yet-to-be formed nation-state in political liminality — neither completely sovereign nor entirely subjugated. While this ambiguity has obvious ramifications for Palestine as a political entity, it also places the cultural heritage of Palestine in potential jeopardy. This paper examines the legal and historical construction of liminality for Palestine and explores how its ambiguous political status impacts the preservation, protection and management of cultural heritage in Palestine and influences the construction of cultural heritage narratives by Palestinians. Of course, in Jordan, for a little archaeology, they move villages. But Israel is still slapped around by Toner. But more than hypocrisy, we know that the United States provides funds for archaeological and cultural projects of Arabs in Judea and Samaria. In other words, the US is in direct competition with Israel about preserving history in Judea and Samaria. The only question is whether that history is to be true and genuine or corrupted and fake. What will America go with? Will it be provocative and unhelpful? The United States has joined the Philippines and forty other nations in adopting a Memorandum of Understanding (MOU) to promote the conservation and management of migratory sharks...The MOU was negotiated under the auspices of the Convention on Migratory Species to foster scientific research on, and to enhance the conservation and management of, seven initial species of migratory sharks: the Basking, Great White, Longfin and Shortfin Mako, Porbeagle, northern hemisphere Spiny Dogfish and Whale sharks. Signatories to the MOU may subsequently include other shark species in need of conservation. ...the negotiations successfully navigated several technically complex and challenging issues in order to reach agreement. These included the number of species to be covered, the legal nature of the MOU, and the relationship between the MOU and the overarching Conservation of Migratory Sharks. Maybe they are at least practicing on sharks in preparation for bigger fish? ...QUESTION: A release by the Democratic Front for the Liberation of Palestine has a statement claiming 100 refugees from the Al-Waleed camp that’s inside Iraq have left the country and will be resettled in the United States. Can you confirm that? MR. CROWLEY: I don’t think that number is correct. I think we’ve had several hundred Palestinians referred to us over a period of time. I think so far in this fiscal year, nine Palestinians from Iraq have arrived in the United States. The basis for this program is that while you are familiar with the work of the UN Relief and Works Agency for Palestine refugees in the Near East, known better under its acronym UNWRA, but Palestinians in Iraq are not covered by that program, but are the responsibility of the UN High Commissioner for Refugees. So we are working with the UN on this issue and we have had some Palestinians come to the United States, but not that large a number. MR. CROWLEY: So far in this fiscal year, we’ve had nine. QUESTION: Is it correct that these – at least some of these people are going to Alaska? QUESTION: Could you check on that? MR. CROWLEY: I sure can. QUESTION: Because it would seem to be a bit of a geographic mistake to send them to – to send Palestinians who have been living in Iraq and then before, to Alaska. MR. CROWLEY: So you don’t think that change of pace is appropriate – beautiful mountains? Do they have something against Alaska or is it just Palin? 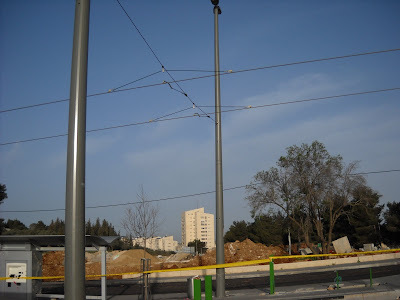 The Jerusalem Light Rail is going electric. Last night I attended another HADAR event. 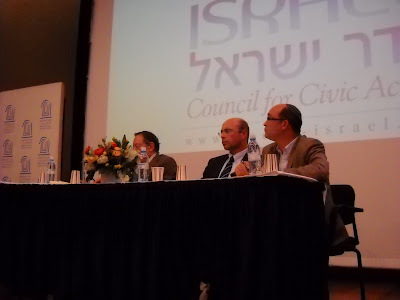 It was devoted to the subject of Lawfare and the panel, emceed by the Jerusalem Post editor David Horovitz, included Professor Irwin Cotler, Canadian Member of Parliament and former Justice Minister, Lieutenant Colonel (res.) 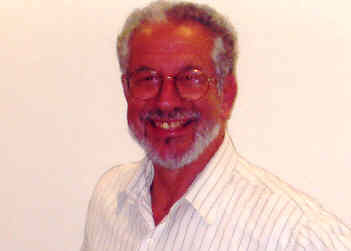 David Benjamin, the former director of the international division of the IDF Advocate General and legal advisor for the Southern Command in Gaza and D.J. Schneeweiss, the anti-boycott coordinator for Europe at the Israel Ministry of Foreign Affairs will respond. The audience of over 250 enjoyed their remarks which I found that they all knew what they were talking about, said it fairly well and even made suggestions about what to do. The ideas were cogent. In comparison to other events of this type, this was a good evening. It was held in conjunction with Europeans for Israel and Brenda Katten, who I first met in England 35 years ago, also spoke. I think I have a solution for the 'segregated' buses demand, where men and women are separated, men in front and women in back. The men will simply sit on the laps of the women. You can't have it the other way due to the yeitzer hara, the evil inclination. Rav Yisrael Yitzhak said: do not read 'travail' but 'travel'. I stumbled over a reference to the Limerick anti-Jewish riots and thought I should assemble the information for you, too. In 1904 there were over 150 Jews living in Limerick, a small city at the head of the Shannon estuary. At the turn of the century, anti-Semitism certainly existed in Ireland. The prejudice was imported from Europe and accepted by many. When this nonsense was preached from the pulpit by one Father John Creagh in 1904 (a priest of the Repemptorist order whose views were not officially sanctioned by the Catholic Church), the Catholic population were duly incited. In 1899 Arthur Griffith, the founder of Sinn Fein, wrote that 'the three evil influences' were Jews, Freemasons and pirates. Father Creagh preached that the Jews were 'blood-sucking' money-lenders and that a common Jewish ritual was to 'kidnap and slay Christian children'. He urged a boycott on Jewish businesses. It was alleged the Jews added substances to the tea leaves they sold and that they were physically unhygenic. Over the next two years the small Jewish population was subject to a trade boycott which brought them to financial ruin. They suffered harrasment, intimidation and abuse (both physical and verbal). There were no fatalities but most were forced to leave the city. There have been other individual instances of violence and displays of prejudice against Jews since then, but the Limerick pogrom is the only organised campaign of anti-Semitism in Irish history. On the European scale these events may seem insignificant, but to the people of Limerick they leave an indelible stain. A Lord Mayor of Limerick stated in 1970 that the pogrom was justified in 'defending the impoverished Limerick population against the exploitative Jews'. In 1904, in Limerick, Father John Creagh, a priest of the Redemptorist order, incited the local population against "blood-sucking" Jewish money-lenders and travelling pedlars. His sermons brought about a two-year trade boycott of Jewish businesses, which was accompanied by intimidation, abuse, harassment and beatings (although there were no fatalities) and resulted in the almost total departure of the 150-strong Limerick Jewish community. The issue of the Limerick "pogrom" resurfaced three times in more recent years, when various individuals sought to justify it. In 1965 there was correspondence following a television programme on the incident by Radio Telefis Éirean (RTE), the national broadcasting agency. In 1970, there was a further controversy when the then lord mayor of Limerick, Stephen Coughlan, declared his support for Father Creagh's "defending the impoverished Limerick population against the exploitative Jews". The issue flared up again in 1984, with the Jews being defended mainly by left-wing politicians. Only in 1990 did Limerick seek to make amends to its Jews by restoring the city's Jewish cemetery. In the Republican movement at the turn of the century, Arthur Griffith, the founder of Sinn Féin, published antisemitic articles in the nationalist paper the United Irishman . In 1943, Oliver J. Flanagan, a Dáil (house of representatives) member for the Fine Gael party, aroused little protest when he proposed to the house to "rout the Jews out of this country". Creagh received his theological training in France in the era of the Dreyfus affair, no doubt returning to Ireland having absorbed the antisemitic culture prevalent in France at the turn of the century. His sermons brought about a two-year trade boycott of Jewish businesses which was accompanied by harassment and beatings (although there were no fatalities) and resulted in the almost total departure of the 150-strong Limerick Jewish community. The messianic complex of a young and vigorous priest reacted with a surly, pent-up resentment, to produce an ugly display of bigoted thuggery. The clear hostility of the city burgers to the Jewish population also underlines the success of the immigrants in the lines of business which presumably had hitherto been the province of Corporation aldermen. By 1904, there were roughly 35 Jewish families in Limerick, a total of 150 people. They lived in Collooney Street (now called Wolfe Tone) and had their burial ground in Kilmurray. The first link in the chain of violence came in January when, at a large Jewish wedding attended by the whole Jewish community and a number of Christians, Judge Adams commented on the vibrancy and success of the Jewish community. This produced a sour report in the Limerick Leader, comparing the prosperity of the Jews to the poverty of native Limerick people. Father Creagh, spiritual head of the Limerick Confraternity of the Holy Family, which even then had a membership of 6,000, took up the case. In a sermon the following Monday, he bitterly attacked the Jews. He was later to claim that "the Jewish religion has nothing whatever to do with my statements", yet obviously from his first controversial speech, it was a very significant factor for him. The metaphor he used to open his sermon was certainly unambiguous enough. "It would be madness for a man to nourish in his own breast a viper that at any moment might slay its benefactor. So it is madness for a people to allow grow in their midst that which will eventually destroy them. . ."
The viper, as it transpired, was the Jewish population. Their initial crime, Fr. Creagh claimed, was that they rejected Jesus. "They crucified Him . . . they called down the curse of His Precious Blood on their own heads. And when they were scattered over the surface of the earth, they bore with them the unquenchable hatred of Jesus Christ and his followers. . . They persecuted the Christians. . . they slew St. Stephen, the first martyr, and ever since as often as opportunity afforded they did not hesitate to shed Christian blood, and that in the meanest and cruellest manner, as in the case of the Holy Martyr St. Simeone, whom they crucified out of hatred and derision of our Lord Jesus Christ. Twenty years ago and less Jews were known only by name and evil repute in Limerick, sucking the blood of other nations, and now they've fastened upon us . . ." and so on. Of their habits Father Creagh was equally sure. "Nowadays they dare not kidnap and slay Christian children, but they will not hesitatc to expose them to a longer and even more cruel martyrdom, by taking their clothes off their backs and the bite out of their mouths. . . They came to our land to fasten themselves like leeches and to draw our blood when they have been forced away from other countries." That was clear enough as well. Their purpose, Fr. Creagh outlined darkly. "Are the Jews a religion? I do not hesitate to say that there are no greater enemies of the Catholic Church. . . The Jews are in league with the Freemasons in France, and have succeeded in turning out of that country all the nuns and religious orders. . . The Redemptorist Fathers to the number 200 have been driven out of France." And their achievements in Limerick received full elucidation. "They have wormed themselves into every form of business. . . in furniture, mineral water, milk, drapery and into business of every description, and trade under Irish names." The litany of their malevolence was thorough. They forced their wares on unwilling women, they extorted their clientele by subtle manipulation of credit, they were ruining Limerick's trade. The Jewish population were portrayed as the cause of all Limerick's troubles. This bile and brimstone sermon had its effect. 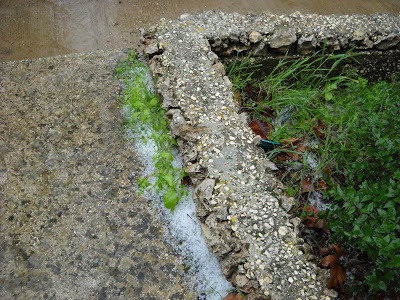 Large numbers of confraternity members, joined by their wives and children, launched an attack on the Jewish sector of the town, pelting Jews with mud, breaking windows, and throwing stones. In the subsequent prosecutions of eleven people, it was admitted that at least 300 people took part in the attack. Probably, it was more. Ten of the culprits received fines, ranging from 2/6 to 101-. The case against the other defendant was dismissed. Michael Davitt was prompted by this outrage to write of the events. "I protest as an Irishman and a Catholic against this barbarous malignity being introduced into Ireland under the pretended form of a material regard for the welfare of our workers". Davitt was particularly sensitive to anti-semitism; only the year before, he had written an account of the persecution of the Jews in Kishinev, the capital of Bessarabia. At the trial of the eleven, Davitt's letter was dismissed as the unwarranted intervention of an outsider-a response that seems to be the hallmark of Limerick authorities in any age. Nash, the defence Counsel who scorned Davitt's intercession, also claimed the events were greatly exaggerated. Whether they were or not, they set the precedent. Father Creagh then claimed that he deprecated violence, that if the citizens of Limerick want to put an end to Jewish commercial enterprise they should boycott it. It was a cry echoed fervently by the Limerick Leader, the Irish Independent and by Father Murphy, spiritual director of the Women's Confraternity. Creagh claimed that Limerick was merely the centre of their activities, and that their network spread far beyond it. The violence continued throughout January, but seems to have tapered off then. Far more pernicious was the boycott, which severely hit the Jewish traders. Many people were reneging on their debts, and the Jews were unable to collect without the threat of violence. Witnesses later declared that they thought the terms the Jews demanded were reasonable but that they were driven into complicity with the boycott by their neighbours and the native authority of Father Creagh. Despite recent claims that this credit was the consequence of rapacious moneylenders, no single contemporary source mention them as a source of friction. What was very probably behind the hostility was that some women in their husband's absence had been gulled into buying something on credit which they could not afford. In late March, the violence flared up again. In the last week of that month and the first of April, there were over forty attacks on Jews, and Father Creagh continued his educational courses in Hebrew perfidy. "Jews have always been a danger to the Christian people: they were the cause of the Spanish Inquisition being instituted." His sense of history varied from the indiffcrent to the dangerous. He reasserted his belief in the old medieval fantasy of Jews secreting young boys away for obscene rites and ultimately murder, quoting as authority medieval chronicles which at best warrant extreme circumspection. His logic was impeccable. "But why did every other land persecute them? Simply because of the vile practices of the Jews." His mission in life was not lofty. "The Jews are a curse to Limerick, and if I have the means of driving them out, I shall have accomplished one good thing in my life." Martin Indyk has a screed at the "Australia Jewish Democratic Society" http://www.ajds.org.au/node/144 defending the New Israel Fund and attacking my friend, Gerald Steinberg. While I have known you for many years, and we often disagree, I did not expect you to join the campaign of personal attacks and hysteria launched in response to detailed analysis and legitimate concerns regarding the role of the New Israel Fund, on whose board you currently sit. I am also surprised by the many false claims you made under the banner of “The Truth about the New Israel Fund”. Rather than engaging in more mud-slinging, I am drawing your attention to some of the basic errors of commission and omission in your highly emotional defense of NIF. For additional documentation, see NGO Monitor. change in Israel and the defense of the human rights for all its citizens. Indyk: NIF opposes...ultra-nationalism in all its manifestations, both within Israel and among the nations and organizations that relate to Israel. Indyk: Inevitably, some of them, especially in the Arab sector, will take positions that, as an individual, I strongly oppose, since they cannot be expected to buy into every aspect of the Zionist narrative. But I will at the same time strongly defend their right to speak out as long as it is in responsible ways. We all agree on free speech, which, as you know, is a pillar of Israeli democracy. But the issue here is large-scale NIF funding that artificially amplifies the highly destructive voices, whose goal is to silence the “Zionist narrative”, to use your jargon. Using NIF donor money, these organizations contribute to demonization in the UN and elsewhere. 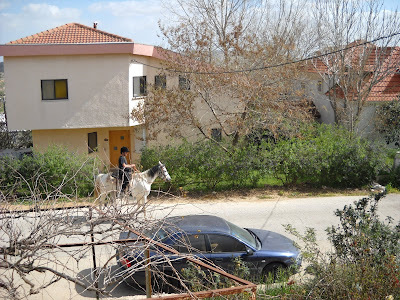 Connecting individuals, institutions, and agricultural operations abroad together with small independent farmers in Israel in order to collectively increase production efficiency and profitability. 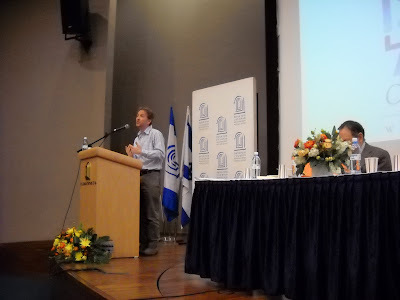 Educating those in Israel and abroad to the critical needs of the small independent farmer in Israel through public forums such as, but not limited to, Jewish and Christian places of worship and media. Bringing those individuals and groups to Israel who share a passion for Israel religiously and/or economically as it relates specifically to agriculture and the land of Israel. 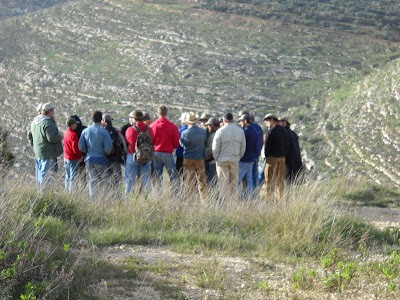 Equipping and enabling those who share a passion for Israel’s complete agricultural restoration to work within their congregations, organizations, and/or communities to promote the work of HaYovel. Mayor of Jerusalem, Nir Barkat and IFCJ Founder and President, Rabbi Yechiel Eckstein will announce today the renewed cooperation between IFCJ and the City of Jerusalem in a large scale project to fight poverty in the city, in which IFCJ will donate 13.5 million NIS. Both parties expressed their satisfaction with this renewed cooperation. Upcoming Projects include: "From Dependence to Independence"- A 6 million NIS grant teaching hundreds of needy families in Jerusalem how to gain economic independence. Families that will participate in the project will receive a wide range support which includes: professional training for the unemployed, tutorial aid for children in school, information on how to exercise their rights, workshops on strengthening the family unit, and workshops on participating and contributing to society. 2 million NIS of this donation will be dedicated specifically for the Ethiopian community/ IFCJ will donate two "Urgent Needs Funds" in the sum of 1.5 million NIS to the Jerusalem Welfare Offices. equipment, vital electric goods etc. One of the Funds will be an emergency support fund, to be used in case of natural catastrophes, terror attacks etc. 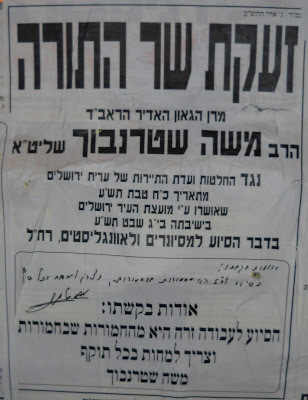 4 million NIS for building a Spiritual and Cultural Center for the Ethiopian community in the Talpiot neighborhood. 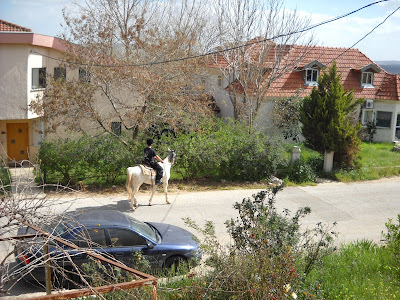 The IFCJ supports over 150 municipalities throughout Israel. Its donation to the City of Jerusalem is the largest of all. The International Fellowship of Christians and Jews (IFCJ), based in Chicago and Jerusalem, is the largest funder of social services in Israel after the government. Through the generosity of its donors, most of whom are evangelical Christians, IFCJ has in recent years contributed hundreds of millions of dollars toward Jewish immigration, resettlement, social welfare, and security projects in Israel, as well as supporting numerous projects that help impoverished Jewish populations in the former Soviet Union and around the world. Remember That Underhanded EU Boycott Project? 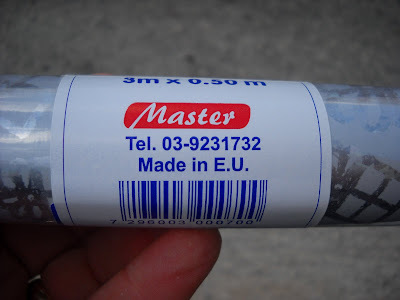 The EU wants to know exactly where in the "territories" products were made so that the Jewish communities and their industries can be pinpointed by no-lovers of Zion. The Dutch term for hypocrisy seems to be either huichelachtigheid, schijnheiligheid or plain hypocrisie. I just want to make sure Mr. Serry gets my point. "These sites are in occupied Palestinian territory and are of historical and religious significance not only to Judaism but also to Islam, and to Christianity as well. I urge Israel not to take any steps on the ground which undermine trust or could prejudice negotiations, the resumption of which should be the highest shared priority of all who seek peace." Question: Regarding the presentation done by Mr. Serry, is he going to make any further contacts, Robert Serry, on Hebron and the recent attachments? Is he going to do any further contacts with the Israeli Government to rescind these decisions? Spokesperson: Well, as I said, I’ve read out the statement, which you also have available, and he is obviously speaking to the authorities, the Palestinian Authority, and speaking to the Israeli Government the whole time. So, I would not rule that out. But, for the moment what we have is what is in the statement, which is that he is very concerned about it and he is urging Israel not to take any steps on the ground that could undermine trust or prejudice the negotiations. Question: Besides such statements, is the Secretary-General going to do something about it, through the Quartet or through making any special contacts with the Israeli authorities…? Spokesperson: Well, at the moment, the most import thing is we have the Special Coordinator for the Middle East Peace Process, Robert Serry. He is on the ground. That’s his job; to engage with the Israeli authorities and with the Palestinian Authority and with other in the region. And I think that that’s the right chain of command, if you like, for the moment. Well, Mr. Serry, let's get back to huichelachtigheid or whatever. I won't even get into that "occupied Palestinian territory" mantra. So uncouth. Let's talk about what "significance" really means. You denounce Israel's declaration of a heritage preservation program while at the same time the UN and you ignore the desecration and destruction of Judaism's most sacred religious, cultural and historical site: the Temple Mount. The Waqf Islamic Trust seeks to erase, and has been fairly successful over the years, all Jewish identity connected with that site. That's not significant? Earth has been dumped out, left for Jews to sift through. Remains have been covered over or outright defaced and destroyed. That has no significance? The UN should have been the first institution to come to our aid and assistance when those things occurred and while they continue to happen. And here are the warmongerers. I don't understand why there hasn't yet been a demonstration or protest vigil outside your offices. But there will be a Temple Mount Awareness Day soon. Another JPost Blog Post: Dubai or Iran? Headline editor flubbed this one. ISRAELI TROOPS clashed in Hebron yesterday with a crowd of angry Palestinians protesting against the Israeli government’s decision to add the West Bank city’s Tomb of the Patriarchs to a list of Israeli heritage sites. Well, that is a clearer statement. But it still needs more 'why?' input. The 'why?' element is more clear but is there something else? The Tomb of the Patriarchs, the biblical burial site of Abraham, Isaac and Jacob, is holy to both Jews and Muslims and has been a flashpoint for religious tension in the past. Some 500 Jewish settlers live in an Israeli-controlled enclave close to the tomb, surrounded by 170,000 Palestinians under the jurisdiction of the Palestinian Authority. Okay, what is your average Irish reader to understand? Well, he could assume that Jews are stealing another religion's holy site, one that is, at the least, only half their's. And that accusation. Is their an Israeli response? Cannot the reporter add a sentence pointing out some facts? But the Irish reading this paper won't know that. Israel does not have to listen to anybody who claims to be pro-Israel. In fact, Israel does not have to listen to anybody who claims to be anti-Israel. Israel does not have to listen to anybody who claims to be pro-Israel just because they are Jewish, or even Christian or any other social, religious or national identification. Israel surely does not have to permit the fostering upon it of a group like J Street simply because it claims to be either Jewish, pro-Israel or a representative, as Yehuda Ben-Yehuda of Haaretz put it, of an "elite". Where does Jeremy of J Street come off demanding, as by right, that Israel do what he wants it to? And then, as expected, when it doesn't, lead a cheap calumny charge of castigation to further demonize Israel as a pariah because it doesn't do the 'accepted/expected' thing that progressive just know it needs to do? Who the heck to you think you are, J Streeters? Sure, suggest, deliver advice, organize, visit but, just as you tell Israelis - don't make demands, don't elevate yourselves high on some artificial pedestal of presumed self-righteousness, viewing from on high in a posture of aggrandized self-importance which is hollow and false and destructive. Democracy as a system works both ways. Israel, too, has the right of free expression and action and it has chosen, basically, to ignore you and marginalize you. That's Israel's prerogative. That's what sovereignty is all about versus Diaspora Jewry. Israel can choose by itself its own friends and know who are its enemies. You may not grasp that, due to some pomposity you have clothed yourselves with, but as Obama fellow-travelers please remember that every President's policies are a passing phenomenon while the Jewish state is forever. The 'agra' is the term for the tax, actually, the radio/television license fee, paid for owning a radio or TV. All the money goes to the Israel Broadcasting Authority (IBA). If you promise only to watch Channel 2, 10 or cable or satellite, you still have to pay. Where those transmitters placed in those communities? It's a very hilly countryside out here with lots of valleys for 'deadzones'. Did Martin Kramer Advance the Cause of 'Genocide' for Pals.? Ali Abunimah’s Electronic Intifada, a death-to-Israel website, says that in my Herzliya Conference speech, which I posted two weeks ago, I “called for ‘the West’ to take measures to curb the births of Palestinians, a proposal that appears to meet the international legal definition of a call for genocide.” According to the site, “Kramer proposed that the number of Palestinian children born in the Gaza Strip should be deliberately curbed, and alleged that this would ‘happen faster if the West stops providing pro-natal subsidies to Palestinians with refugee status.’” The usual suspects, Philip Weiss and M.J. Rosenberg, have jumped on the bandwagon. Being accused of advocating genocide by people who daily call for Israel to be wiped off the map of the Middle East is rich. Aging populations reject radical agendas, and the Middle East is no different. Now eventually, this will happen among the Palestinians too, but it will happen faster if the West stops providing pro-natal subsidies for Palestinians with refugee status. Those subsidies are one reason why, in the ten years from 1997 to 2007, Gaza’s population grew by an astonishing 40 percent. At that rate, Gaza’s population will double by 2030, to three million. Israel’s present sanctions on Gaza have a political aim—undermine the Hamas regime—but if they also break Gaza’s runaway population growth—and there is some evidence that they have—that might begin to crack the culture of martyrdom which demands a constant supply of superfluous young men. That is rising to the real challenge of radical indoctrination, and treating it at its root. "Israel's Occupation through the Lens of the Education System"
Been informed by Israel Academia Monitor. Over the past four decades Israel's occupation of the West Bank, Gaza Strip and East Jerusalem has changed dramatically. Using the Palestinian education system as a case study, Neve Gordon argues that these changes were triggered by a series of contradictions and excesses emanating from the structure of Israel's occupation, and not from the policy choices of military or political leaders. He shows how during the occupation's first two decades Israel attempted to mold the dispositions of the Palestinian students and teachers so as to normalize the occupation. The education system, in other words, became a prime site of management and control (and resistance). Next, he briefly focuses on the Palestinian universities in order to show how Israel's forms of control produced excesses and contradictions that precipitated social unrest and political crisis, leading Israel to change its policies and forms of management in the territories. 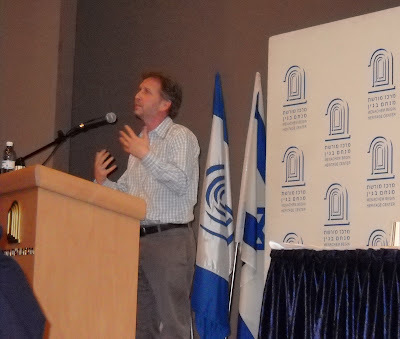 Finally, he discusses Israel's current approach towards the Palestinian education system. Focusing, once again on the universities, he illustrates how Israel is no longer interested in influencing the aspirations, views and attitudes of the students and teachers, which suggests that the population is no longer conceived as an object that needs to be managed. This does not mean that Israel is no longer interested in continuing the colonization project, but rather that Israel no longer considers the management of the population as a necessary component of the colonizing mission. If Israel has so much power and control, why couldn't they 'educate' for peace? Could she not have altered the affects of Najah and Bir Zeit educational institutions? And why has the sole driving agenda item for the Pal. education system, now fully under its own control for 17 years (! ), been hate, terror and denial of any Jewish element? Neve is capable of a 40 year case study? Neve is such a nut. I'm Confused - Next Chapter in "Canaanite Eyes"
I have blogged several times (here and also here) about the new academic paradigm postured by Arabs and others in a "pro-Palestinian" theory which is termed "Canaanite eyes". In a word, just as the foreign Jews supposedly invaded Canaan and destroyed the local population and then occupied the territory, so, too, Zionism is repeating this crime. This line sees in the Arabs who assume a "Palestinian" identity the true Biblical people of this land. They are the inheritors, the "original inhabitants". The problem, though, is that over the decades and now, faster and faster come the discoveries which confirm all the chronicles as related in the Bible, one-by-one, that tell the Jewish version of events. And after the new Biblical discovery of a Jewish presence in Jerusalem at Solomon's time, what is their problem? Palestinian archaeologists have criticized their Israeli counterparts’ rush to link finds to the Bible. Now they boo-hoo about the Bible. Odd, though, as the Koran confirms the Jewish narrative. 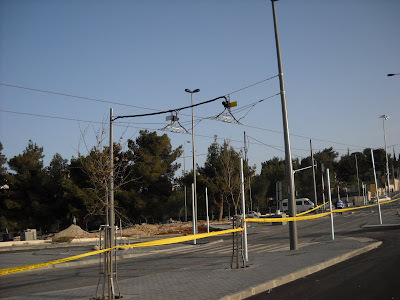 On Monday (Feb. 22), Army Radio reported that Palestinian security forces gave Israel information on a Qassam rocket manufactured in Judea and Samaria planned to be launched towards Israel. According to estimates, the rocket was ready to be launched towards the center of the country. Information about the existence of the rocket was received from the Palestinian security apparatus. The detection of the rocket is due to the successful cooperation between the IDF, the Civil Administration and the Palestinian Security Forces, as reflected in several recent cases, such as right-wing activists’ breach to Jericho where cooperation between both forces avoided a violent confrontation between Palestinians and Israelis. Well, one good news item and three bad news items. One: the rocket launch was halted. Two: they are trying to shoot rockets and have the capability. Three: the IDF Spokesperson's Unit should know that Judea and Samaria are two different regions. Where was the rocket placed for launch? Four: although the Pals. informed Israel of its existence, were they not capable of eliminating the threat themselves? Those were the three bad ones. That's a 75% negative news item. ...Pottery shards discovered within the fill of the lowest floor of the royal building near the gatehouse also testify to the dating of the complex to the 10th century B.C.E. Found on the floor were remnants of large storage jars, 1.15 meters in height, that survived destruction by fire and that were found in rooms that apparently served as storage areas on the ground floor of the building. On one of the jars there is a partial inscription in ancient Hebrew indicating it belonged to a high-level government official. Now, anybody see any Canaanites recently? Anyone heard from Ir Amim? That Mizrachi archaeologist? The BBC has up eight or so photographs taken by the International Red Cross. It purports to "highlight the difficulties of many Arabs [they actually wrote "Palestinians"] who live near Jewish communities [they actually wrote "settlements"] in the Judea and Samaria [they actually wrote "West Bank"]". But it's all worthless propaganda, well, not worthless. Thanks to Jean Chung and Laurent Meirehans who seem to have snapped the wonderfully angled pictures. I don't think there's a similar series but just the reverse - Jews living in close proximity to Arabs who suffer rock-throwing, firebomb-tossing, shooting, travel difficulties, closed roads , etc. Yes, BBC, Jews suffer harassment. You don't think so? Will complaints be submitted to the BBC? Go on, go here and submit one. It's Poker? "I'll See You, and Raise the Ante"? TEL NOF AIR FORCE BASE, Israel (AP) - Israel's air force on Sunday introduced a fleet of huge pilotless planes that can remain in the air for a full day and could fly as far as the Persian Gulf, putting rival Iran within its range. The Heron TP drones have a wingspan of 86 feet (26 meters), making them the size of Boeing 737 passenger jets and the largest unmanned aircraft in Israel's military. The planes can fly at least 20 consecutive hours and are primarily used for surveillance and carrying diverse payloads. At the fleet's inauguration ceremony at a sprawling air base in central Israel, the drone dwarfed an F-15 fighter jet parked beside it. The unmanned plane resembles its predecessor, the Heron, but can fly higher, reaching an altitude of more than 40,000 feet (12,000 meters), and remain in the air longer. "With the inauguration of the Heron TP, we are realizing the air force's dream," said Brig. Gen. Amikam Norkin, commander of the base that will operate the drones. "The Heron TP is a technological and operational breakthrough." The commander of Israel's air force, Maj. Gen. Ido Nehushtan, said the aircraft "has the potential to be able to conduct new missions down the line as they become relevant." 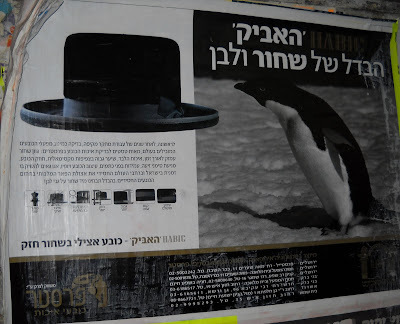 My neighbor's great-aunt, a Krishevsky, died three months ago in Meah Shearim, also a Satmar, and she had just over 1000 as she had but 10 children. As for myself, I was so peeved that I was not asked to join the team or even have my passport used by whoever carried out the targeted assassination. Heck, the shopping there seems great. My wife makes oven-cooked [or is that baked?] vegetables for Shabbat. I am not quite sure whether there are different temperatures, or rather length of time in oven, for different types: potatoes, sweet potato/yam, pumpkin, squash and onion, for example, which are on our table but they come out good in any case, for the most case. These fries have savory, crisp, dry edges, and they’re satisfying and somewhat addictive, just like regular fries. I use a mix of regular and sweet potatoes for this. Choose waxy potatoes, like new potatoes or red potatoes, which have a lower glycemic index than starchy russets. 1. Preheat the oven to 500 degrees. Line a sheet pan with aluminum foil, shiny side up [I think the special non-stick baking paper my wife uses could be used as a lower layer]. Place in the oven while you prepare the potatoes. 2. Cut the potatoes into wedges that are about 1/4 inch thick at the thickest point. Place in a large bowl, and toss with the olive oil and salt to taste. 3. Remove the hot pan from the oven, and add the potatoes to the pan in an even layer. They should sizzle. Return to the oven, and lower the heat to 450 degrees. Roast 25 minutes or until tender. 4. Remove the pan from the oven, and loosen the potatoes from the foil using an offset spatula. Return to the oven and cook for another five minutes. Serve at once, seasoned with more salt if desired. The Internet is very good at generating gossip, but lousy at the dogged work of transforming rumor into news. Reached for comment on Sunday, a J Street official declined to respond to the allegation, except to say that the congressional delegation’s concern came from news reports of a Foreign Ministry boycott in Israeli newspapers including Ma’ariv and Yediot Aharonot. Oh, so now they get their news about what they do from the press? Backward? Or Just Der Stürmer? 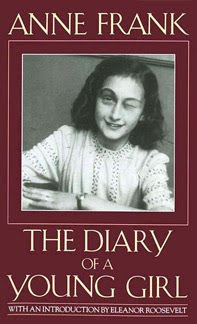 Yes, that's Holocaust victim Anne Frank photoshopped as winking. 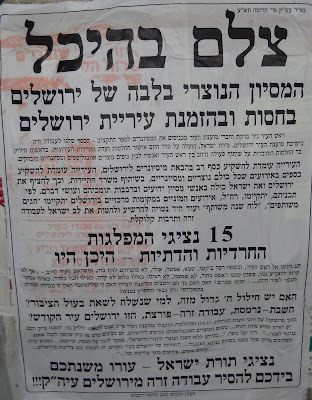 the Der Stuermer-style caricature of Chazan with horns that was run as a newspaper ad in the Jerusalem Post and carried as signs by protesters outside Chazan’s home. well, I guess I can call the publication of that fake ad not only a perversity but a defamation of the sacredness of Jewish suffering. Oh, and border-line Der Stürmer, - and JJ, note the correct spelling. Of course, sometimes, left-wing radical progressive forces just don't know anything about democracy, respect and awe, basic Jewish values. Tobin vs. Klein - Who Is Antisemitic? 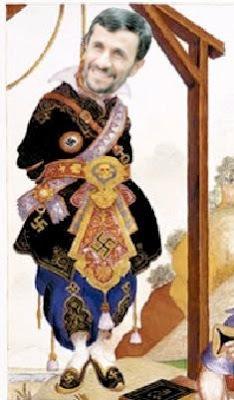 Why Won't The Guardian Barf Up Bapthrope? Light Rail Goin' To Roll? Objective Reality? In A News Media? Ha!